Last week, WebMD Health Corp., the leading source of health information, honored its 2015 Health Hero award winners who were recognized for their remarkable dedication to changing the healthcare landscape and for providing inspiration to those looking to overcome their own health challenges. Good Morning America co-host Robin Roberts kicked off the evening by welcoming the crowd and recognizing this year’s outstanding class of winners. Glenn Close was selected by the WebMD community as the 2015 People’s Choice Award winner; Kenneth Shinozuka was presented the Prodigy Award; Ronald “Jake” Clark received the Advocate Award; and Dr. Bennet I. Omalu received the Scientist Award. The star-studded event included Seth Rogen, Harry Carson, Jessie Close, Kevin Lacz and Fran Drescher. The evening also featured musical performances by Amos Lee, Mary McBride and The Broadway Boys with hit songs including,Violin, I Don’t Need No Doctor, and Heroes. 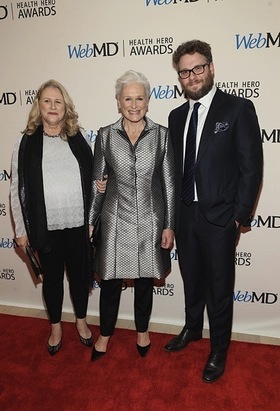 This year’s WebMD Health Hero Awards Gala was supported by Allergan (allergan.com) and Cancer Treatment Centers of America (cancercenter.com). WebMD’s Health Heroes each receive a $10,000 donation from WebMD to his or her cause and will be featured in the November/December issue of WebMD Magazine. In addition, each winner was presented with a custom designed award created by Thingsmiths using 3D printing technology. To read more about WebMD’s Health Heroes, or to learn more about the Awards Gala produced by Scott Mauro Entertainment, Inc./ Scott Mauro, Executive Producer, visit www.webmd.com/healthheroes.